In March 2012, the US higher education consulting firm Noel-Levitz and The National Association of Graduate Admissions Professionals (NAGAP) conducted an online survey of the recruitment practices of American graduate schools. The survey drew 247 respondents nationwide, including 45 private and 33 public, doctorate-granting institutions as well as 130 private and 39 public, master’s institutions. Respondents were asked to rate as many as 80 recruitment practices on a four-point scale: “very effective”, “somewhat effective”, “minimally effective”, and “method not used”. Included in the field of 80 recruitment strategies and tactics were ten practices focused specifically on international recruitment. ICEF Monitor has summarised the rating for these in the table below, with the responses broken down by institution type. The table provides a summary value for each strategy or tactic to indicate the percentage of respondents who rated it “very effective” or “somewhat effective”. It also provides an accompanying value for each (noted in parentheses) to indicate the percentage of responding institutions reporting they were currently using each method. The table differentiates between those results that are statistically valid and those that are not – results that are not statistically valid due to small sample size are marked with an asterisk throughout. Finally, we have also noted in bold type the top three, statistically valid responses for each category of institution described below. The effectiveness of ten selected methods of international student recruitment as rated by survey respondents, and, in parentheses, the percentage of respondents currently using each method. Source: Noel-Levitz and NAGAP. There are some interesting observations to be drawn from the Noel-Levitz/NAGAP survey as it pertains to international recruitment. The development of web pages targeted to international students was a consistent top-three response across the four categories of graduate schools in the survey, with roughly half of all respondents actually operating websites targeted to international prospects. 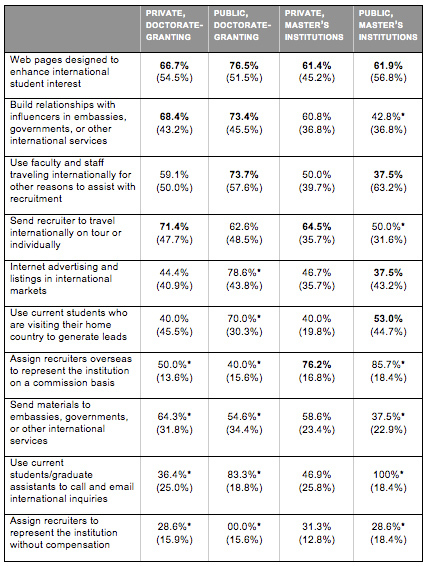 Among the four categories of colleges responding, private, master’s-level institutions were most likely to highly rate the use of commissioned representatives abroad, with 76.2% rating this method as either “very effective” or “somewhat effective”. However, less than 20% of respondents, across all categories of responding institutions, reported actually using commissioned agents. Many of the top 10 practices (at least three of the 10 for each sector examined) were not being used by a significant portion of the poll respondents, sometimes more than half… A significant percentage of respondents across institution types, up to 75 percent, reported using practices that most respondents of their type judged to be “minimally effective,” with the most commonly-rated such practice for doctorate-granting institutions being local television and radio advertising. These broader observations point to one of the useful applications of the survey itself in that individual institutions can use it as a reference point for evaluating or benchmarking their current mix of recruitment strategies and tactics. In this respect, the survey is also a very useful series of admissions metrics, including such measures as “conversion rate from inquiry to application” and “yield rate from admission to enrollment” that many institutions will find helpful for benchmarking performance across prospect management and admissions systems. The complete benchmark study is available online as is a special appendix that provides additional, detailed findings for international recruitment practices. This entry was posted in Higher Education, Marketing, North America, Regions, Research, United States and tagged higher education statistics, tertiary education overseas, international students, postgraduate student recruitment, student recruitment.